[Written for DDN 03/2012] A short story that follows our favorite couple during their weekend afternoon and evening. [Written for DDN 10/2011] It's Halloween, and Kagome encounters someone she never expected to wait for her. But was it really only her imagination? Oneshot based on The Lovely Miko's weekly Prompts/Quotes challenge. You do not know what you are missing until it is gone. [Written for DDN 08/2011] Kagome meets her neighbor and spends an evening getting to know him, unaware of who he really is. [Written for DDN 09/2011] Sesshoumaru looked forwards to any time spent with Kagome. 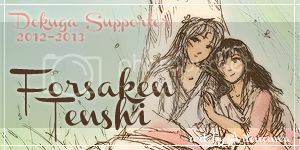 [Written for Halloween DDN 2011] Sesshoumaru comes home to find that all is not well in his household. [Written for Valentine's Day DDN 2012] Time heals all wounds, or so they say. Despite the centuries, his remained as fresh and raw as the day he received them. Only her touch, however ephemeral, could heal them. Rated for Inuyasha's crude language. Twoshot. [Written for DDN 11/2011] Time had changed her perception of him for the better. [Written for IDDN 11/2011] A power-hungry hanyou threatens to destroy the delicate balance between youkai and ningen coexistence, and it's up to Sesshoumaru and Kagome to stop him. [Written for DDN 12/2011] A Cinderella-esque story with no evil step-sisters and a not-so-"Cinder"-ella with an attitude. [Written for DDN 01/2012] Stranded in her own time, Kagome falls into depression and is rescued by the most unlikely savior. [Written for DDN 02/2012] At Kagome's request, Sesshoumaru recounts the (in her opinion, abysmally shoddy) method he used in an attempt to capture her romantic interest. [Written for Wild Thicket for Dokuga's Secret Valentine 2012] Kagome is a young noblewoman who loves horses. She disguises herself as a boy to work with them in the royal stables. Sesshoumaru is the Crown Prince and owner of the horses. Is her disguise good enough to fool the Prince, or will he call her out with his keen observation skills? [Dokuga Contest Oneshot] Kagome unknowingly encounters a kindred spirit. Repost as a stand alone. [Dokuga Contest Oneshots] The well did not spit Kagome out exactly when she expected. Sequel to In Plain Sight. Reposted as a stand alone. [Written for DDN 01/2013] When the Western heir breaks their relationship to fulfill his duty, how does his left behind girlfriend handle the stress? [Written for DDN 05/2014] When Kagome finds Sesshoumaru on a dissection table at the lab she works at, what's a girl to do? Thank YOU for your review. I'm very glad you liked the story. DDN was a blsst!